Steps Sticky Notes let you choose the size and color you want from the same pad without having to break the pad apart. 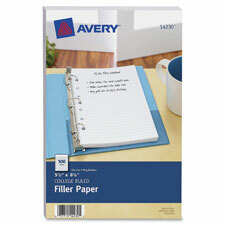 You get five sizes and five colors conveniently stacked in a step-style pad. 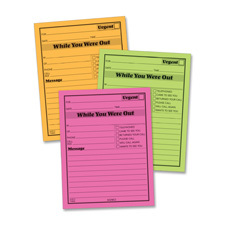 They're the fast, easy solution for quick notes, reminders, to-do lists and more of the most appropriate size and color. And fully removable adhesive lets them stay in place or remove cleanly. Each pad provides 150 sheets that include 30 each of 3" x 2-1/2", 3" x 3", 3" x 3-1/2", 3" x 4", 3" x 4-1/2". Lay Flat Sticky Notes offer a fast, easy and convenient solution for quick notes, reminders, to-do lists or just to help you get and stay organized. They have an additional adhesive strip on the bottom so your notes stay flat and won't wrinkle, crease, curl or flap. Fully removable adhesive lets you apply and remove cleanly. Each pad includes 45 notes. 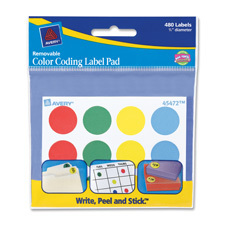 Color-coding label pad lets you write, peel and stick these 3/4" round labels wherever you need them. Simply write on the label, peel away from the pad and stick. Removable adhesive adheres firmly but removes cleanly. Compact design makes it easy to store and access. Each pad has 40 sheets. Each sheet has 12 labels. 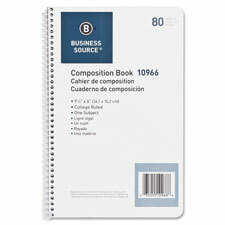 Spiral wirebound notebook includes stiff cover and back for protection and durability. Bright white 16 lb. sheets are college ruled to keep your writing neat and organized. Notebook is ideal for home, school or office.